Not just for carpet cleaning, this Pro-Flex 2" vacuum hose is as good as they get for carpet cleaning and other demanding, industrial uses. Strong, chemical & heat resistant yet light-weight & flexible! Don't learn the hard way... lesser vacuum hoses will kink, leak, tangle and degrade quickly in harsh environments. This is a super premium, high quality carpet cleaning vac hose. This 2.0" carpet cleaning vacuum hose is second to none. Built heavy duty, yet surprisingly light, for ease of use by the Professional Carpet Cleaner who wants nothing but the very best. This vac hose will not crush, kink or tear. Built to handle the high heat & chemicals associated with powerful Truck-Mounted Steam Extraction Systems. This super premium Carpet Cleaning Hose will increase vacuum in carpet cleaning extraction machines due to it's smooth inner bore. This 2 inch Vac Hose comes naked (without hose cuffs) or other vacuum hose accessories, but we offer a multitiude of Cool Cuffs for you to add above. Helps reduce fuel consumption by reducing air flow resistance due to smooth inner bore. Helps carpets dry FASTER than 2" hose that don't have the smooth inner bore. Flexible to comfortably coil into approx. 2' diameter circles. Will Last for many Years! Non-marring, Very sturdy & PVC Free! 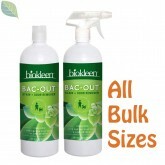 Product is built from Polyethylene, a much safer & extremely durable plastic. For best results, skip the 1.5" whip end, and use a Cleaning Wand with a 2" tube. This will maintain noticably higher airflow thus obtaining greater cleaning results, increase cleaning speed & decrease drying times. 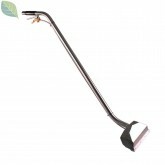 If you are cleaning with a medium to high powered truck mount, we strongly recommend upgrading to 2.5" hose. 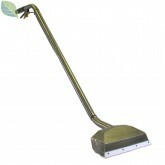 Expect cleaning jobs to go about 5% faster and carpets to dry about 10% faster. 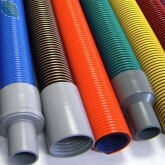 At Bulk Green Cleaners, we offer both basic PVC plastic "thread on" Hose Cuffs & Connectors, as well as the premium Cuff-Lynx Quick Connect hose connectors & cuffs above, for this 2" (2.0") high quality, industrial use vacuum hose. Please select the options you need to connect your hoses, and keep in mind... whatever number you fill in in the "Qty" box to the left of the Add to Cart Button, will increase not only the number of Hoses, but also the Cuffs selected in the drop-downs - by that amount. You can Click Here to view the PVC Cuffs and Quick Connect Cuff Lynx available for this 2 inch vacuum hose. Please Contact Us if you still need help selecting connectors.